​The photograph below shows the first home in Portland belonging to Peter and Amalia Müller (Miller). The photo was taken about 1908. At the time, the address was 768 E. 13th N. which is now 3627 NE 13th (near Fremont). The house remains standing as of 2017. ​Amalia Miller (née Glantz) is shown in the center holding her daughter Anna Christina. Standing to the left of Amalia is her daughter Christina Katherine Miller (with dark hair). 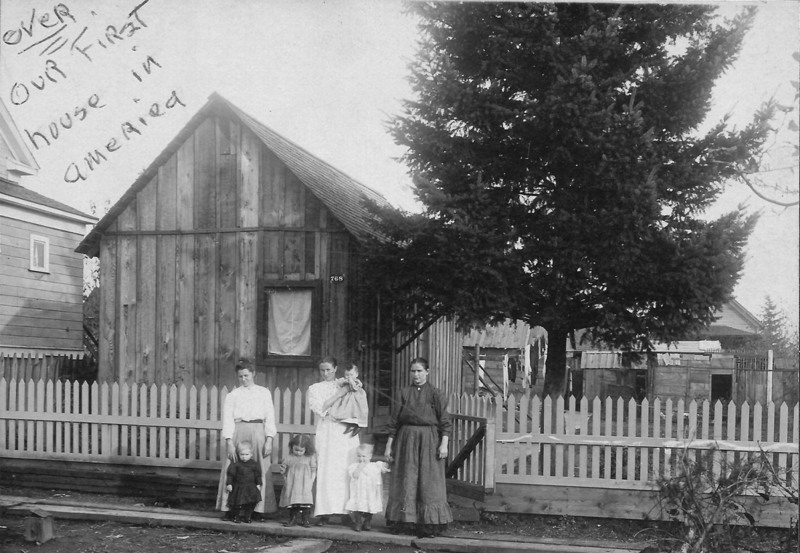 The women on the left and right are unidentified neighbors with their children. ​Amalia was born in 1887 the daughter of Jacob Glantz (born 1862) and his wife Dorothea Lehmann (born 1868). ​All members of this family are from Norka, Russia. Amalia died in 1963 and Peter died in 1967. Photograph courtesy of Chuck and Sandi Weihe (Sandra Jean Dunston) of Missoula, Montana. Sandi is the granddaughter of Peter and Amalia Miller and the daughter of Anna Christina Miller.